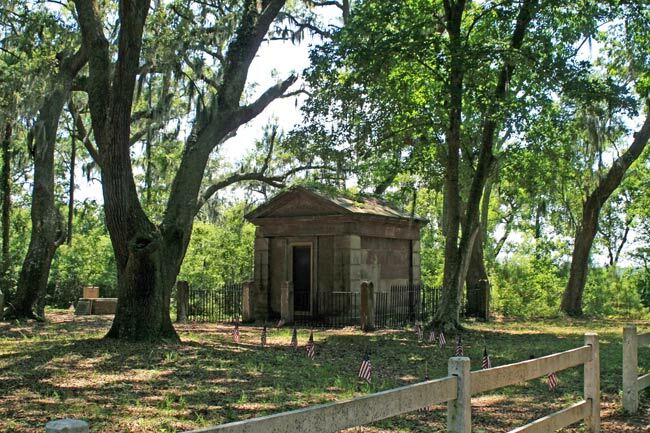 The cemetery with its historic Baynard Mausoleum is all that remains of the Zion Chapel of Ease on Hilton Head Island. The chapel was built around 1786 as part of the Episcopal St. Luke’s Parish, which was established in 1767 and included what are now Hilton Head Island and Bluffton. The Zion Chapel of Ease was built to accomodate islanders who were inconvenienced by boat travel to the parish’s primary church, St. Luke’s, on the mainland (Bluffton). 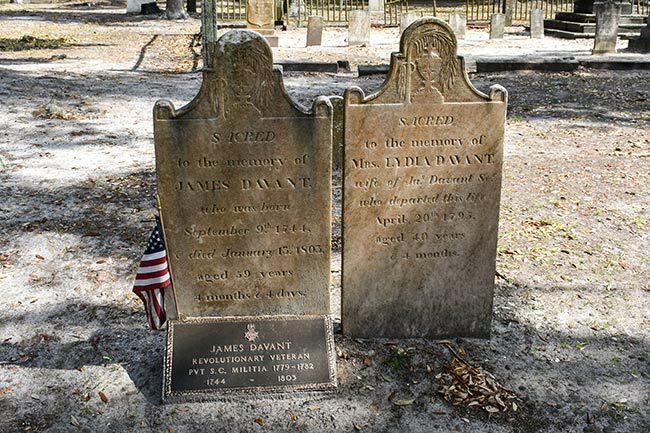 Within the cemetery are the remains of four Revolutionary War patriots, including Charles Devant, who was ambushed and killed near this site by Captain Martinangel’s Royalist militia in 1781. Members of the local William E. Baynard family were once interred in the mausoleum, but their remains have since been moved. 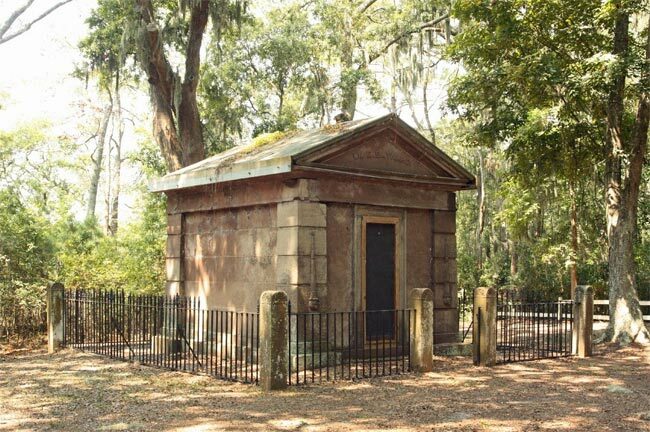 The mausoleum was built in 1846 and is the oldest remaining structure on Hilton Head Island. The grounds of the Zion Chapel of Ease and cemetery sit along Mathews Drive, named for the chapel’s first permanent priest. Reverend Philip Mathews arrived to the island in 1811 and served as the St. Luke’s Parish rector until 1828. Union troops occupied the area during the Civil War in 1862, including the chapel, and residents were forced to flee to the mainland. By 1868, nothing of the Zion Chapel of Ease remained other than its cemetery. 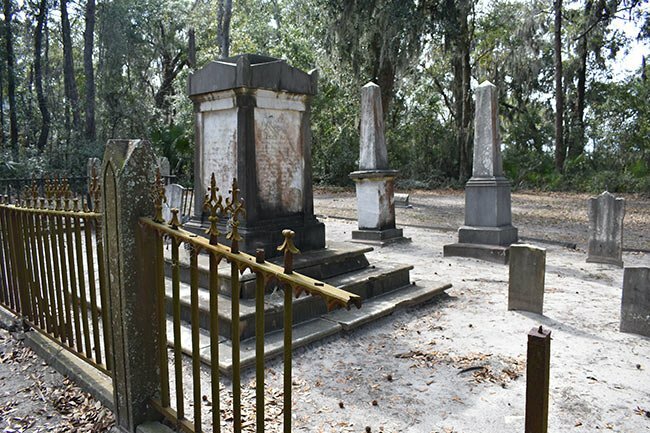 The St. Luke’s Parish Zion Chapel of Ease Cemetery, located at the corner of Mathews Drive and William Hilton Parkway on Hilton Head Island was listed in the National Register October 5, 2017. The Zion Chapel of Ease Cemetery is significant at the local level under Criterion C for its distinctive funerary art from the late eighteenth and early nineteenth centuries. 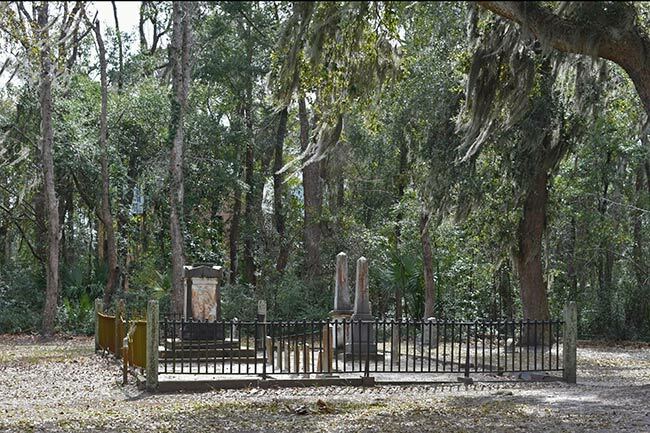 Criterion D (Archeology) applies because of the site’s potential to yield significant information about the Hilton Head planter elite through the study of their mortuary practices, and for the potential to locate and study the remains of St. Luke’s Parish Zion Chapel of Ease, which was destroyed in the 1860s. 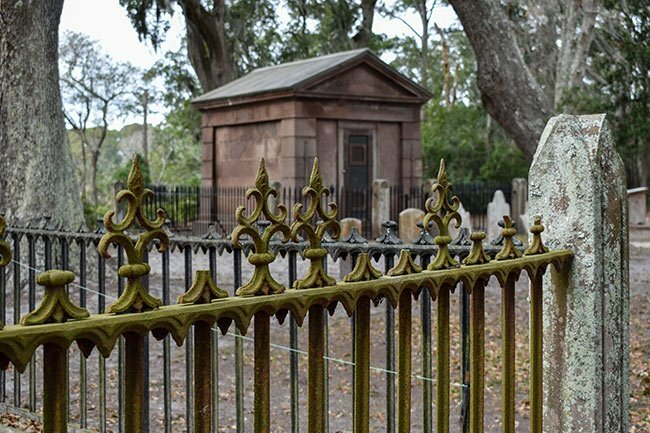 The Zion Chapel of Ease Cemetery is an extremely rare piece of physical above-ground evidence of the colonial and antebellum history of the island. 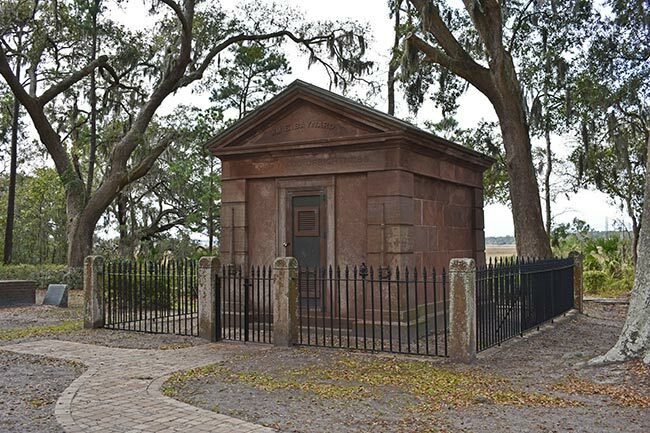 Indeed, the Baynard Mausoleum located within the cemetery, and constructed in 1846, is believed to be the oldest intact structure on Hilton Head Island. 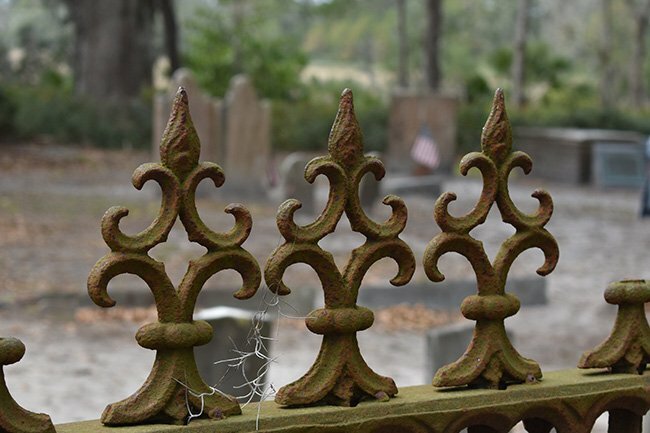 The cemetery contains thirty-four markers, including the Baynard Mausoleum, and two cast-iron fences. Many of the markers are marble tympanum headstones with a willow and urn design and some of these gravesites also include a footstone. Five of the gravestones within the cemetery are marked by the carver’s name or initials. Three of these stones were carved by members of the White and Walker families, who were prevalent stone carvers in Charleston from the 1790s to the 1870s. Good evening. I am a member of the St. James Goose Creek Chapel of Ease and we are trying to get onto the National Register of Historic Places. I noticed your nomination was approved. Congrats on that! I was wondering if I could see/use your submission application as a blue print for our Chapel of Ease? Thanks and have a great day! Has anyone ever heard whistling in the cemetery?